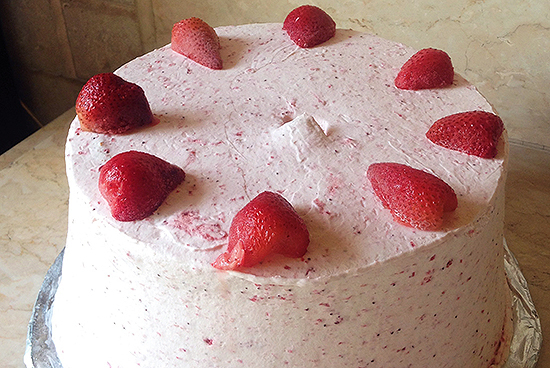 There's more to strawberry cakes than strawberry shortcake. (SPOT.ph) Those who've attempted to transport strawberries from Baguio to Manila via bus know only too well that these luscious fruits are easily perishable. They're expensive, too, when not in season. 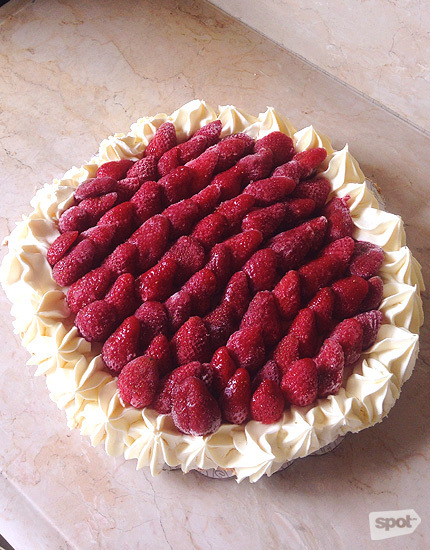 These are some of the factors why there are only a few brave bakers in the city who dare to come up with strawberry-based cakes as part of their dessert repertoire. The cakes we've listed aren't for instant gratification. Because they're the best, they usually require customers to order in advance. Fresh strawberries won't keep and they have to time things just right so you can get the best strawberry experience. When you see a cake lavished with cream, you know you're in for a treat. So read on and plan ahead. You're going to be doing a lot of ordering soon. There are simple requirements to good strawberry shortcake: light and fluffy cake layers, juicy and sweet strawberries, and really yummy whipped cream. This cake, to be ordered 48 hours in advance, nails all three, plus a twist. The cooked fruit is incorporated into the whipped cream icing, giving it a pretty pink hue. It’s fluffy, with a just-right flavor and sweetness. A generous amount of the cooked strawberries cover the top layer, commanding attention and delivering full strawberry goodness. It’s the perfect after-dinner treat! The Pastry Company is at 13 Manhattan Street, Cubao, Quezon City (722-5376). As one of the lightest options on this list, the Strawberry Pavlova makes for the perfect cheat day dessert! This beauty finishes so effortlessly that you won't feel guilty about getting a second or third serving. It boasts a wonderful interplay of textures. 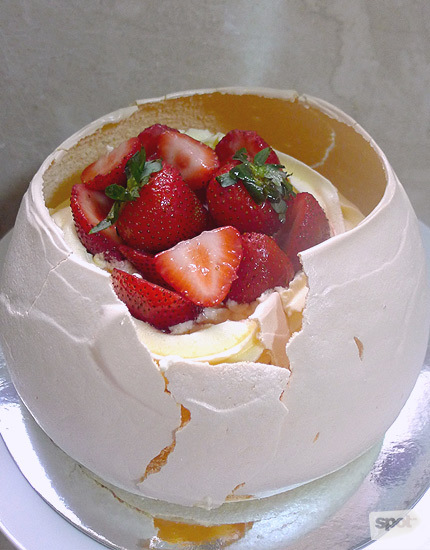 Break the crisp shell to reach that pillow-like meringue topped with delectable whipped cream and juicy strawberries. Is this what it feels like to eat fresh creamy strawberries dipped in sweet clouds? We're becoming delusional. The cake is very delicate, especially the shell, which cracks with ease. Because of its fragile architecture, it's not the quickest treat to transport (by the way, order 48 hours in advance). Don't worry, it's just as good messy. 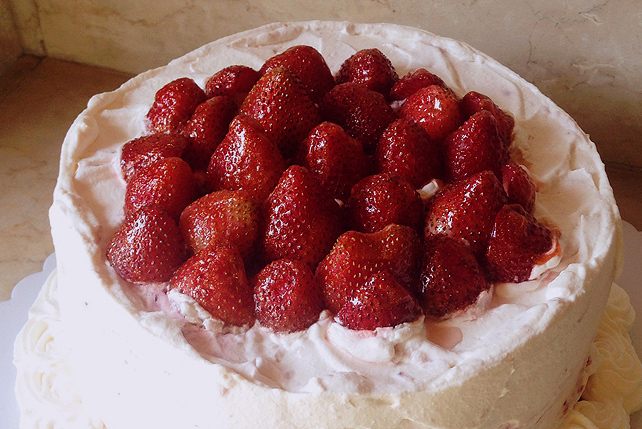 Pavlova Manila is at Tomas Morato, Quezon City (0998-984-9879). 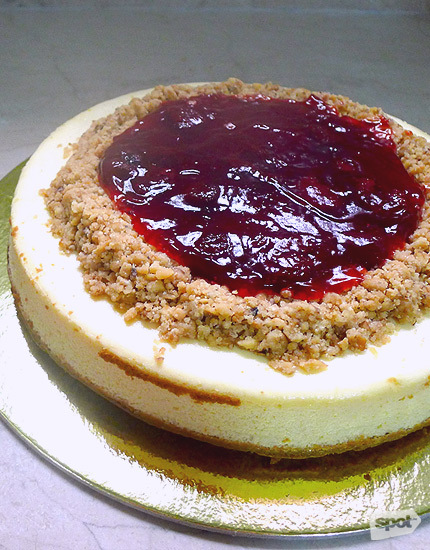 This rich and creamy baked strawberry cheesecake is readily available to sate your strawberry cravings. Because the cooked strawberry topping is so good with such a spot-on flavor, we don't miss fresh fruit too much. It's great with tea or coffee. Want something lighter? Karen also does a mean version of strawberry shortcake. That one, however, requires two days' notice. Karen's Kitchen has branches at 17-A San Rafael Corner San Martin Street, Kapitolyo, Pasig City (234-5118, 631-0944); and Petron, EDSA corner Arnaiz Avenue, Dasmariñas Village, Makati City (555-0555, 555-0111). 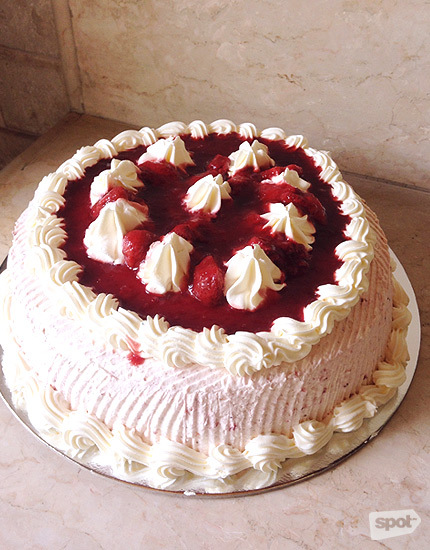 Cuerva is known for their Mango Torte, but they offer the same delicious experience with their strawberry version. The cake is generously topped with fresh strawberries before the entire thing is frozen. The resulting icy sweetness cuts through the richness and flavor of the cream filling and crust, giving off a nice, refreshing balance. It's worth the splurge: The strawberries are huge and plentiful. Cuerva Bakeshop has branches at 2/F Petron, Dasmariñas Village, EDSA corner Arnaiz Avenue, Makati City (844-8278); 1116 Kalayaan Avenue, Guadalupe Nuevo, Makati City (817-0200); Ayala Alabang Village, Muntinlupa City (842-5532). Tokyo's grand dame of desserts can do many things with her iconic mille crepe, one of which is filling it with strawberries. 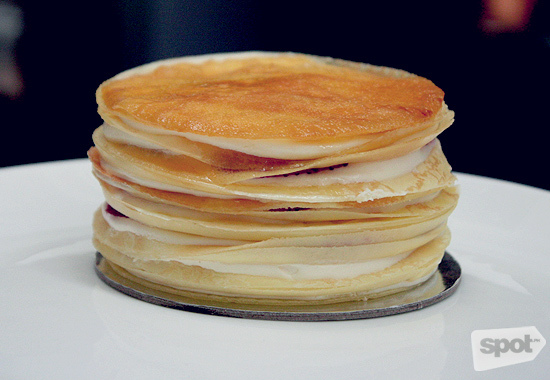 Her cakes each consist of 20 delicate layers of crepe with a light cream filling in between and her signature caramelized top layer. The sweet and tart strawberries give that subtle sweetness some liveliness. Tip: Their version of the strawberry shortcake is also a must-try. 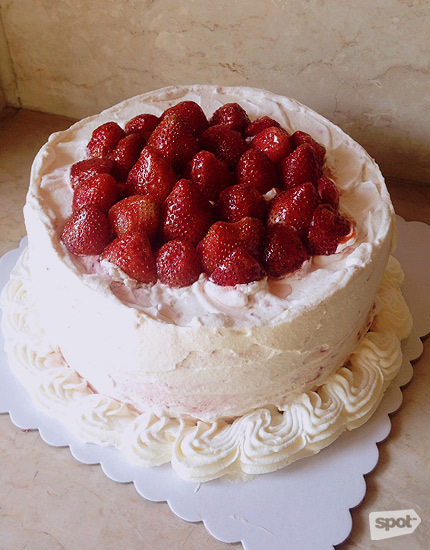 The cake is pretty straightforward and minimal in design—the fresh strawberries on top of the cake are left alone to shine—but the taste is incredibly divine. While the mille crepe is readily available, the shortcake needs at least 72 hours lead time. Paper Moon Cafe has branches at Glorietta 3, Makati City (625-8744); and Trinoma Mall, Quezon City (718-0851). Read more about Paper Moon. This romantic San Juan institution is pretty much established in the food department and the Strawberry Shortcake has its own cult following. 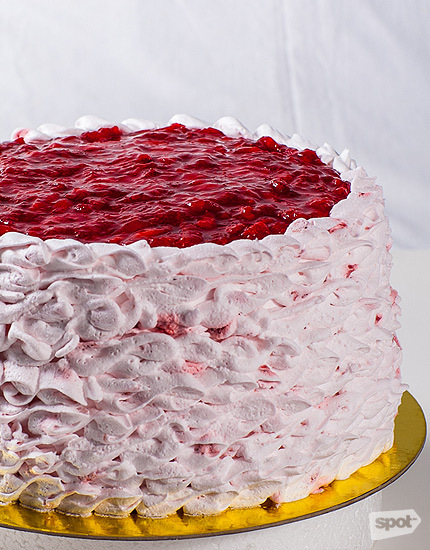 The cake’s light spongy layers are iced with flavorful whipped cream then covered with a sweet strawberry sauce. It's a unique interpretation of an otherwise classic dessert! It doesn’t scrimp on the fresh strawberries, but those who are harder to please would find satisfaction in the Strawberry Shortcake Overload. It's essentially the same, but with more huge, juicy strawberries! Cafe Ysabel is at 455 P. Guevarra Street, Addition Hills, San Juan City (726-932, 725-5089). This cake wins not just for taste, but also for being the most accessible, most readily available strawberry cake in the Metro. 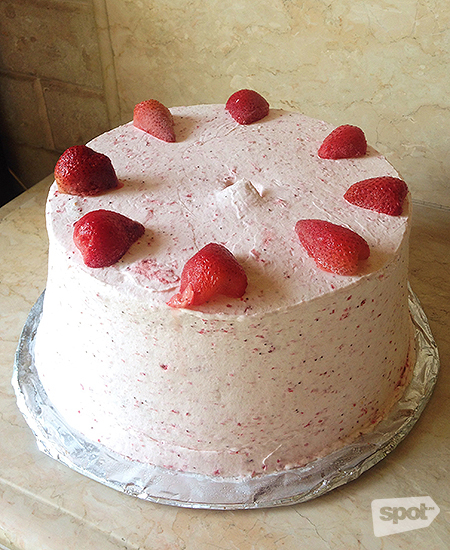 Their three-layered frozen chiffon cake creation is filled and iced with strawberry whipped cream that tastes exactly like ice cream, then topped with a scene-stealing layer of strawberry coulis. The surprise is a layer of cashew nougat, (similar to the base of their bestselling Mango Torte), which adds a nice chewy, crunchy texture to the otherwise soft, melt-in-your-mouth cake layers. Click here for a list of Dulcelin branches. This cake earned the "Famous" in its name when a respected dessert blogger named it her favorite strawberry shortcake. It's made up of three soft and fluffy cake layers, with a generous filling of strawberry-flecked whipped cream in between. The whipped cream that wraps itself around the cake outside not only makes this picture-perfect, it adds to the creamy satisfaction you get from every forkful. The Clubhouse is at UG/L Robinsons Magnolia, Hemady Street, Quezon City (442-5571). 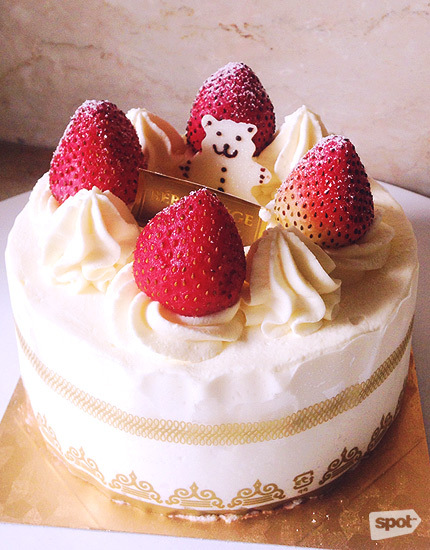 The best strawberry shortcakes are arguably from the patisseries in Tokyo. That's where you can find layers that are incredibly light and moist, with a rich cream that's somehow light as a feather, and perfectly fresh and sweet Japanese strawberries. Bebe Rouge is a pretty close approximation. It's so good, it'll bring out the worst in you—you won't want to share. 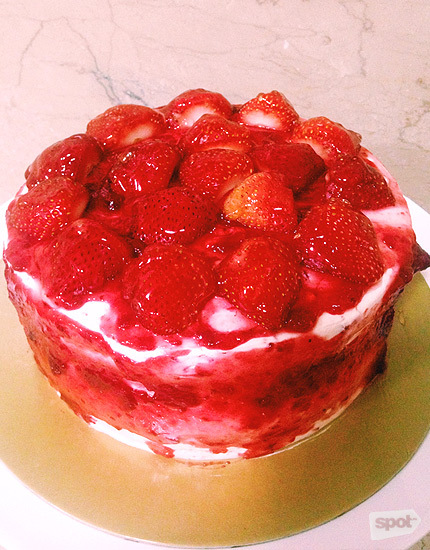 Strawberry lovers will go crazy over the generous amount of fresh strawberry slices in between the cake layers and the additional huge strawberries on top. A premium brand of whipping cream is used for the icing (yup, you can taste the difference in the rich milky creaminess). Patisserie Bebe Rouge has branches at 7602 Sacred Heart Street corner Metropolitan Avenue, San Antonio Village, Makati City (897-7207, 0917-560-7298); and LG/F Century City Mall, Kalayaan Avenue, Poblacion, Makati City (897-7207). Say strawberry shortcake and the top of mind suggestion would be Mrs. Baby Yulo. 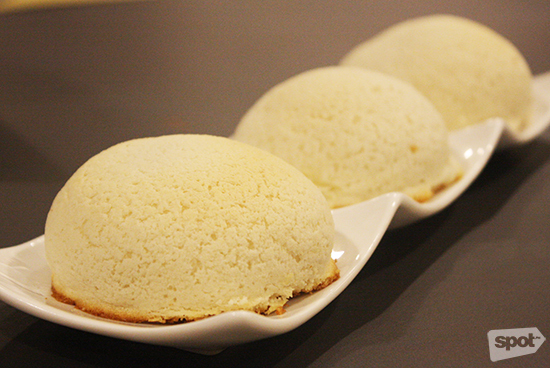 Considered as one of Manila's best homemade desserts, this tall shortcake consists of three layers of sponge filled and iced with light whipped cream and dotted with strawberry bits. The combination of elements truly drives home something that's just tremendously amazing. This is us trying to go easy with the superlatives. It is best stored frozen and actually keeps for a long time in that state. Surprisingly, it doesn’t get rock hard while in the freezer and easily thaws out to a creamy and fluffy state when a craving for a slice hits. It's a default, a fail-safe. This is what every strawberry shortcake should aspire to be. 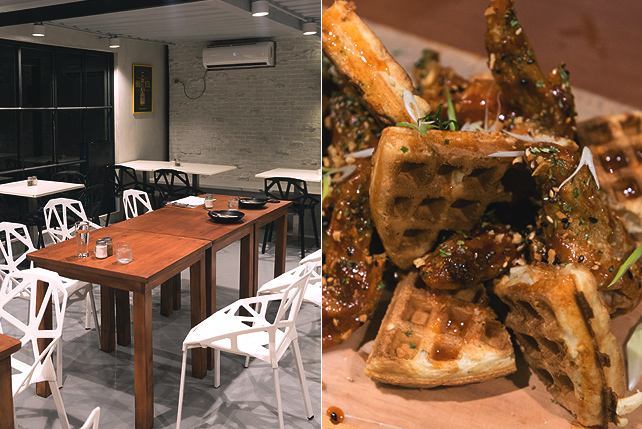 Baby Yulo is at 19 Kawayan Street, North Forbes, Makati City (810-8078, 812-4961).